Leeds United striker Steve Morison has left the club and returned for a third spell at Millwall. Morison has agreed to sever the last year of his contract at Elland Road as Leeds wanted to remove one of the highest earners at the club from the wage bill after bringing in seven new signings this summer. Settlement has now been reached and the 31-year-old Welsh international has signed for former club Millwall for an undisclosed fee - on the same day United completed the signing of winger Stuart Dallas from Brentford. Morison leaves after struggling to come up with goals since arriving at Leeds from Norwich as part of a swap deal for Luciano Becchio. He scored just five times for United in 41 appearances, but became a cult hero with the fans last season with his hard working style up front winning critics over. 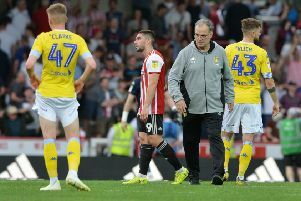 He has been part of Leeds’ pre-season campaign, but looked set to be a bit part player in the forthcoming season proper after the club signed Chris Wood and Lee Ervin who play in Morison’s position. Leeds, meanwhile, are set to receive a payment of more than half-a-million after Max Gradel completed his transfer from Saint Etienne to Bournemouth. United are to profit from a sell-on clause agreed when they sold Gradel to Saint Etienne in 2011. Gradel’s £2m move guaranteed the Elland Road club 10 per cent of any profit made from a future transfer. The winger’s switch to Bournemouth, completed today, is believed to have cost the Premier League side £7m.